Is there a better alternative to Cruise for Lyft? Is Cruise for Lyft really the best app in Travel category? Will Cruise for Lyft work good on macOS 10.13.4? 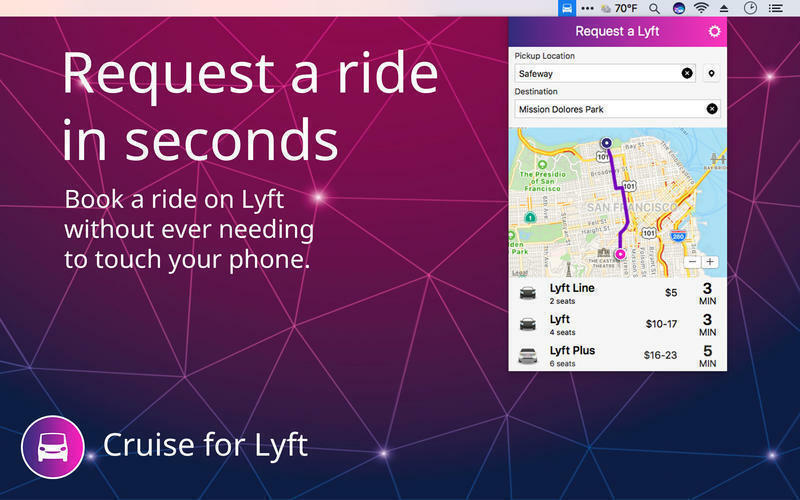 With Cruise for Lyft, you can now get a ride from your Mac without needing your phone at all! Cruise stays in your menu bar, and can quickly be brought up with a keyboard shortcut, keeping ride estimates just a tap away. 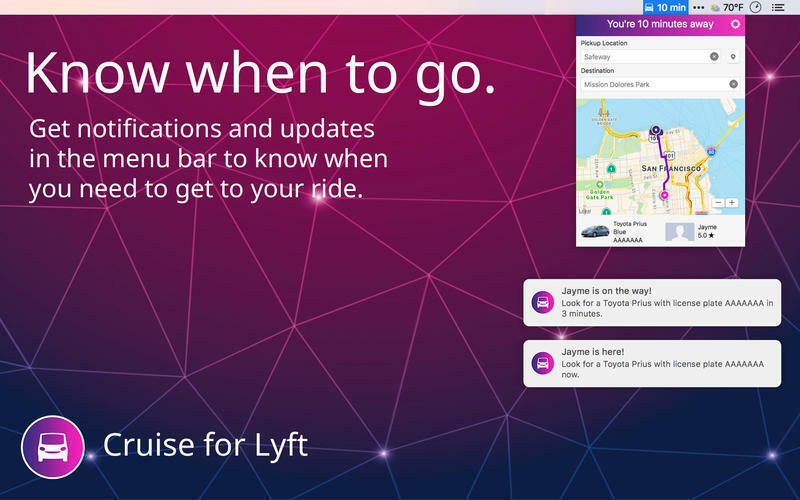 Cruise supports the full Lyft experience, and is powered by the official Lyft API, but is not endorsed, certified, or otherwise approved by Lyft. See all the available ride types in your area, and how far away they are. We'll even keep the nearest ETA in your menu bar so you know when it's a good time to request a ride. This update includes fixes reported by users. Cruise for Lyft needs a review. Be the first to review this app and get the discussion started! Cruise for Lyft needs a rating. Be the first to rate this app and get the discussion started! Enter a destination, or use recent destinations, to get cost estimates. Get a pricing estimate and request a ride. Track your driver's progress on a map to stay up-to-date. Cruise works in tandem with the Lyft app on your phone, and seamlessly transitions between them. It also supports Touch Bar to make it even simpler to request a ride, without even needing to touch a mouse or trackpad! To check if Lyft is available in your area, go to https://www.lyft.com/cities.